Put the curd in a muslin cloth and hang it in a cool place for 2-3 hours. Dissolve the saffron in warm milk. 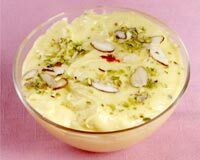 Mix the saffron mixture, curd, sugar and cardamom powder in a bowl. Churn the mixture using a hand blender. Garnish with slivers of almonds and pistachios and serve.